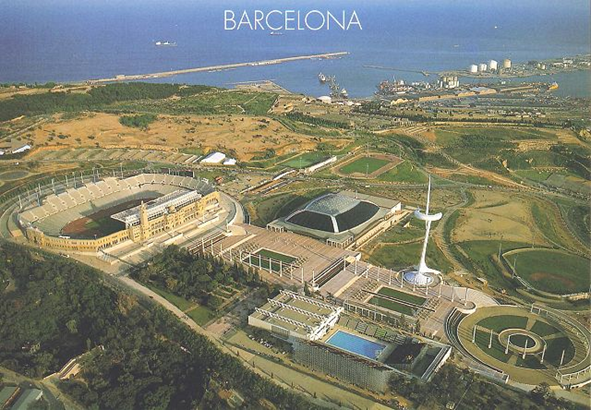 From the Hotel, go to the Plaza Espanya, from where our tour will start the panoramic drive around the Olympic hill. The mountain's name, Montjuïc (Mountain of the Jews), comes from the Middle Ages, when the hill was the site of the Jewish Cemetery. Nowadays it is one of the biggest green areas of Barcelona. The mountain has become a symbol of the city and many attractive things can be seen there. Starting from Plaça Espanya, the two Venetian towers are the gateway to the space that was used for the Universal Exposition in 1929. Several palaces house today's modern Trade Fair, and after the fountains there is the splendid National Palace, built as the royal residence for the Exposition. 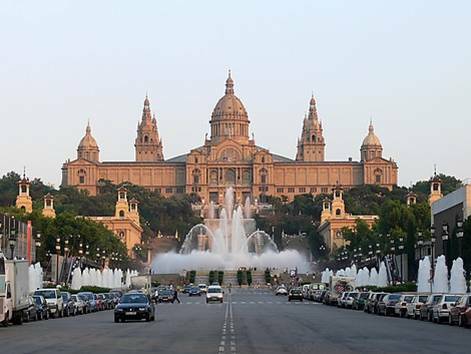 The buildings erected in 1929 for the Exibition are largely intact today, including most of the 15 palaces which have become major museums, such as the recently renovated Museu Nacional d'Art de Catalunya in the Palau Nacional, as well as the archeological and ethnological museums. The Spanish Village was built for the International Exhibition of 1929 as a showcase of Spanish architecture. 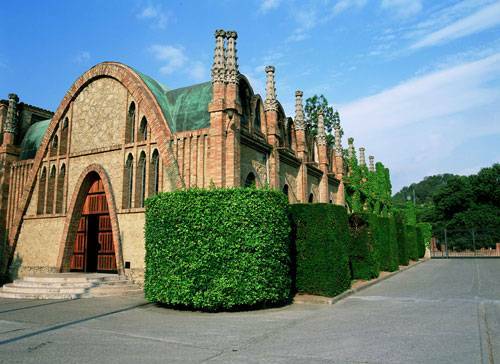 The architects did such a good job that the Village remained after the Exhibition and has become one of Barcelona's main tourist attractions and an important recreational centre. It's fascinating collection of replicas of some of Spain's best popular architecture throughout the ages. You can find buildings and squares from the farthest points of Spain standing together in an integrated ground plan that combines these cultural objects with some of the best entertainment you can find in Barcelona. The Miró Foundation was a gift from the artist Joan Miró to his native city and is one of Barcelona's most exciting showcases of contemporary art. 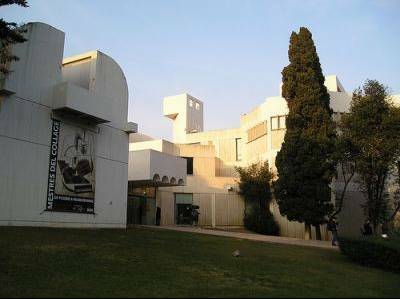 The airy, white building was designed by Josep Lluís Sert and opened in 1975; an extension was added by Sert's pupil Jaume Freixa in 1988. Miró's unmistakably playful and colorful style, filled with Mediterranean light and humour, seems a perfect match for its surroundings. Look for Alexander Calder's mercury fountain. Miró himself rests in the cemetery on Montjuïc's southern slopes. When he died in 1983, the Catalans gave him a send-off amounting to a state funeral. The Codorniu family started making wine in the 16th century and today the company proudly remains one hundred per cent family owned. The earliest historical record of the company dates back to 1551, a testament written by Jaime Codorniu bequeathing wine cellars, presses, barrels and vats to his heirs. Twelve generations later Josep Raventós i Fatjó revolutionised the family business and the Spanish wine industry. His passion for research and innovation led him to study the history and production techniques of the Méthode Traditionelle and in 1872 after a careful selection of local Penedès grapes he produced Spain's first Cava (Spanish quality sparkling wine). 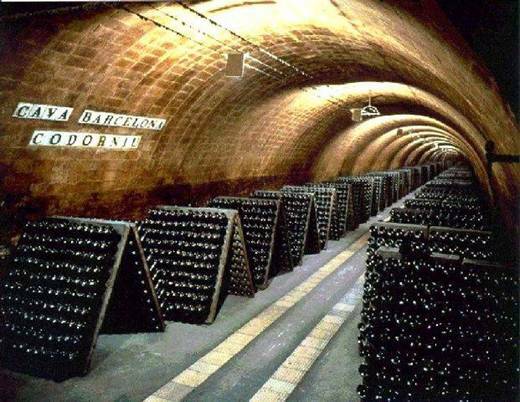 Known locally as 'La Casa Grande', the cellars of Codorniu are the largest underground cellars in the world: 30 kilometres (16 miles) of man-made caves on five levels, containing around 100 million bottles of wine. 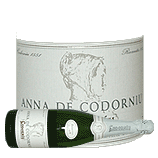 Located in the most dramatic setting, with the Montserrat mountain as a backdrop, Codorniu has been the official supplier to the Royal Palace since the end of the last century. The oldest buildings of the estate were declared National Historical Artistic Monuments by King Juan Carlos I in 1976. 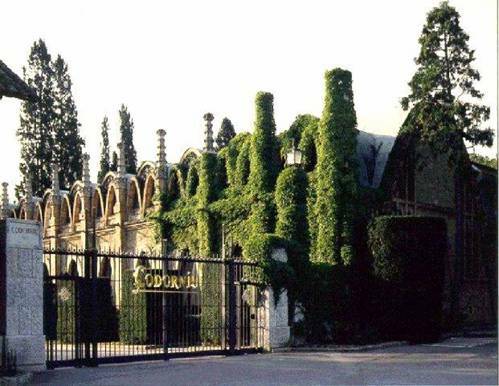 See more information about the cellars at 'Grupo Codorniu' webpage or at Codorniu webpage (requires flash player 7.0).